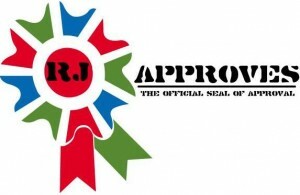 free certificates | RJ Approves This Message! > VMware uses self generated ssl certificates to encrypt session information. > Download Openssl-Win32 (link below) and install it on a windows box to create the certificate signing request. > Preconfigure openssl.cfg (below) and create your rui.csr and rui.key from the config file. > If https error pops up, then the certificate has a passphrase – quick way to restore host is recreate vmware signed certificates by using the following command to restore vclient connectivity. I rebuilt my lab, however I am tired of seeing the above. So lets learn how to add SSL certs to our hosts and make them more secure. We all know that vSphere encrypts session information using digital certs. In my case for my lab, default certificates are fine by if you were working for a huge organization then standard SSL certificates may be a requirement. 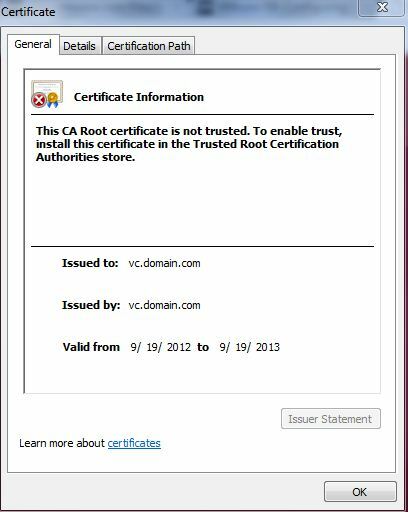 ESXi creates standard certificates by default which are not signed by a CA (certificate authority) and can also be vulnerable to man in the middle attacks. VMware uses standard X.509 version 3 – also known as X.509v3 certificates to encrypt session information over SSL. This also applies to any communication between vCenter and Esxi host as well. Remember when you want to replace the default certificates, the new ones must conform to Privacy Enhanced Mail or PEM format. Privacy Enhanced Mail stores data in a Base-64 encoded distinguised encoding rules -DER format. As always the key used to sign certificates must be a standard RSA Key with an encryption length that ranges from 412 to 4096 bits. The whitepaper recommends a length of 2048 bits. Before we dig deeper, remember if an ESXi 5.0 host is part of a HA Cluster, changing the SSL cert will break HA. To avoid this, make sure you are running vCenter 5.0 U1 or later. Now that Update 1 is out, you might as well upgrade to that before doing anything. You need to download OpenSSL to create a self signed certificate. Now I am using Windows and downloaded the Win32 OpenSSL from slproweb. You can download it here. Once done simply install it. Now we can either do it manually by answering all prompts and then removing the passphrase encrypt key or by manually editing the openssl.cfg file that you find in the directory location below. In the file just replace the bold parts. I picked this up from the kb article. # vSphere OpenSSL example configuration file start. default_md = sha512 # which md to use. # vSphere OpenSSL example configuration file end. I initially did not pre configure the openssl.cfg. You can do it that way as well but remember to remove the passphrase from the key as you don’t want to enter the passphrase for the http daemon every time. If you were wanting to use a commercial signed certs then just send them this rui.csr and they will send in the certificate. To create your own self-signed certificate run the following command. Once we have the above, you will have three files in the /bin directory which are rui.key, rui.crt and rui.csr. We need the rui.crt and the rui.key files. Use WINSCP to copy these two files to the host. In the host navigate to /etc/vmware/ssl and copy the files. Once copied, restart the management agents. Alternatively you can reboot as well. If something screws up no worries as you can restore the vmware certificates by recreating them. You can ssh to the host and recreate the vmware signed certs by the following command. 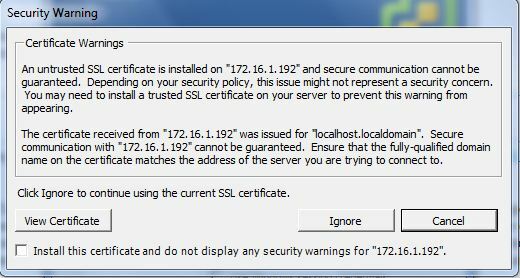 If all went well, get to the https://ipaddress and you should see your self signed cert installed. Now you have your certificate installed!